Known as the "Belle of New Orleans” and is home of the country’s largest gas lantern. Uniformed bellman open the massive double doors for guests walking into the lobby across the magnificent marble floor. Above, spectacular Czech crystal chandeliers cast a heavenly, golden glow, illuminating the fine statuary, American and European antiques and artwork in the room. 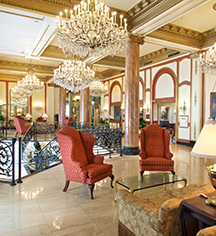 Each of the 226 guestrooms and suites are resplendent with the same period detailing, evoking the historic site's turn-of-the-last-century origins without losing sight of such modern amenities as wireless high-speed Internet access, an on-site fitness center, and rooftop pool and patio. 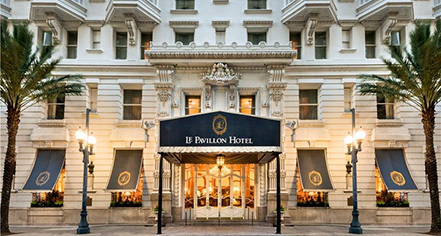 Le Pavillon Hotel, a member of Historic Hotels Worldwide since 1994, dates back to 1907. Complimentary peanut butter and jelly sandwiches are served nightly between 10 p.m. and 11 p.m. in the hotel's elegant lobby. Adjoining Rooms: Adjoining room are available. Please notify request at time of booking. Early Check-In/Late Check-Out: Available, depending upon availability. Early departure fee of full room and tax. Occupancy Restrictions: Varies by room type. Largest room available can accommodate up to six (6) people. Parking: Valet parking: Available; surcharge ($39 per night, per vehicle). Learn more about the History of Le Pavillon Hotel .